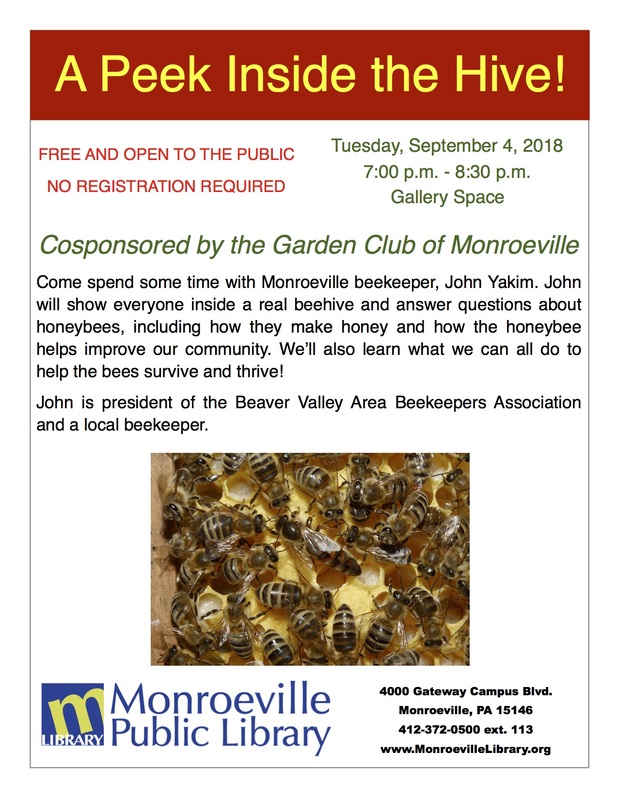 Area Flex-time workers and all who like gardening, you are invited to hear a short program on Final Planning for Plant Sale and Review of new Plants for the Pollinator Garden at Monroeville Public Library's Yolanda Room,﻿ on Tuesday, Apr 23, 2019 4:30-6:30 PM. Members: Meet at Boyce Park Nature Center to transplant at the Greenhouse on Wed. Apr. 10. Unusual herbs and plants and "designer" terra cotta pots will be sold at our Garden Sale on Saturday, May 4, 2019 at Pavillion #2 at Community Park West. 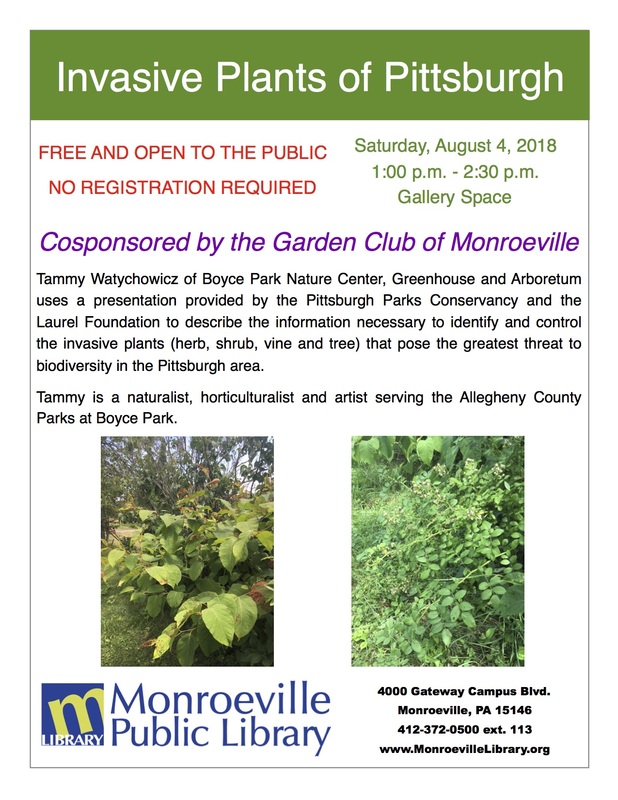 Coming Soon: Maple Sugaring﻿, See the tools used and hear this story from Allegheny County Parks Naturalist Tammy Watychowicz, Saturday, March 2 at 1:00-2:30 PM at Monroeville Library Gallery Space. 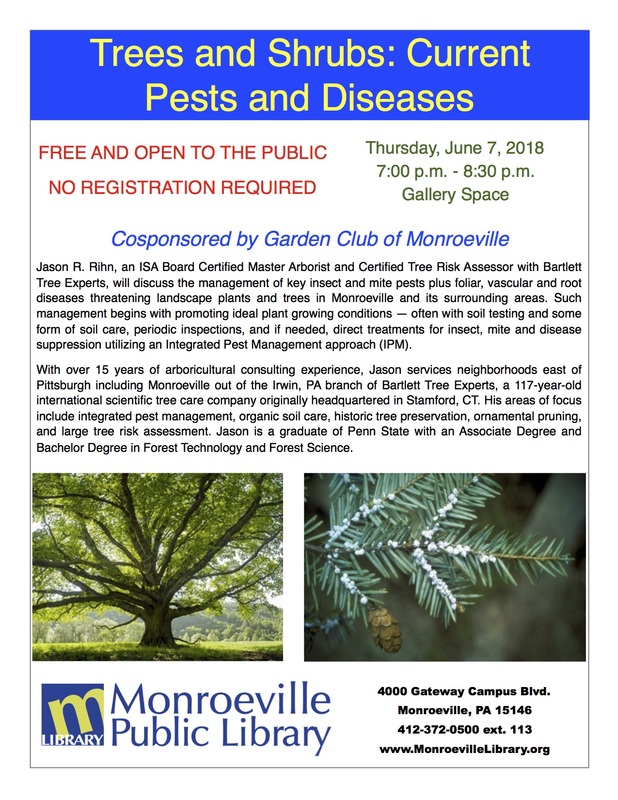 Tuesday, May 28, 2013 ﻿Doris Dumrauf "Creating a Backyard Habitat for Birds and Insects"
May 24, 2015 Ms. Angela McDonnell "An Intervention into Colony Collapse: The Plight of the Humble Bee"
May 25, 2015 Shirley and Gil Brody, ﻿"Gardens of the Garden Club of Monroeville"
September 15﻿, 2015 Steve Piskor "Making the Kindest Cut"
November 17, 2015 Shirley Brody "Color and Choices for Fall Floral Arrangements and Decorations"
May 24, 2016 Matthew T. Junker and John Ashton "Monroeville's Tap Water Quality"
June 14, 2016 Mark Ruehrshneck, "Water Purification in the Home using Reverse Osmosis"
September 15, 2016 Angela Belli "Winnie Palmer Nature Reserve (WPNR)"
October 7, 2016 Ellen Keefe "Westmoreland Cleanways and Recycling"
May 10 , 2017 Ellen Keefe ﻿"Backyard Composting"
June 13, 2017 Elise Cupps "Happenings at Boyce Park"
October 10, 2017 Jonathan Burgess "Free Soil Lead Analysis"
April 17, 2018 Patti Schildkamp "Attracting Monarchs and Other Butterflies into your Garden"
June 7, 2018 Jason R. Rihn "Tree and Shrub Current Pests and Diseases in the Pittsburgh Area"
August 4, 2018 Tammy Watychowicz "Invasive Plants of Pittsburgh"
August 11, 2018 "Caution Botany-Field Trip at Boyce Park"
Sept. 4, 2018 John Yakim "A Peek Inside the Hive"
What's the theme of this page? You can use this area to showcase additional text or photos. 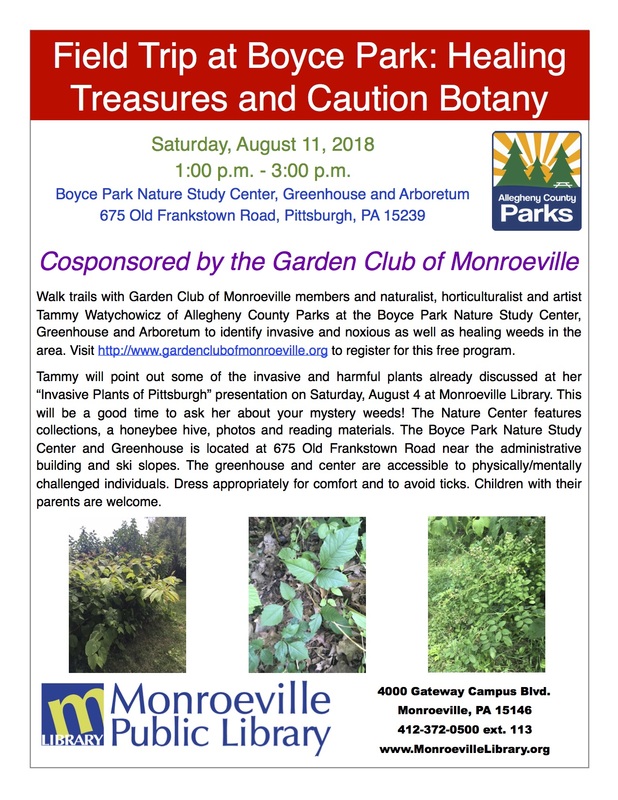 Copyright 2016 Garden Club of Monroeville. All rights reserved.